There are in all fifty-eight mazurkas by Chopin. Pavel Kolesnikov, making a welcome second recording for Hyperion, here performs a selection of twenty-four, from the earliest examples dating from his teenage years, through to the rich maturity of Op 59 No 2 from 1845. Chopin’s mazurkas have the reputation of being connoisseurs’ music, an acquired taste for sophisticates. But there is no particular reason why this should be so, since their charms and profundities reveal themselves just as directly as is the case for his apparently more ‘accessible’ genres like the nocturnes or ballades. Doubtless the misconceptions that surround Chopin’s mazurkas have to do with their evident ‘exoticism’, for listeners are commonly informed that the genre arose directly from the Polish people, that it blended characteristics of three distinct triple-metre folk dances (the mazur, the oberek and the kujawiak) in order to reveal something essential about the Polish music soul. But these are essentialist myths. Chopin did not approach the mazurka as a kind of ethnographer. Though as a youth he did come across some mazurkas played by country folk, his knowledge of the genre was largely informed by urban dance culture: any city-dwelling Pole in the first third of the nineteenth century would have encountered danced mazurkas in all manner of social settings. Published scores of these danced mazurkas reveal simple, diatonic works, which gives the lie to the notion that the complexities of Chopin’s mazurkas somehow reflect their exotic Polish origins. Chopin in his mazurkas did not imitate a Polish sound; he created this sound. That Chopin invented a musical image of Poland is an idea altogether more impressive than any portrayal of him as a dutiful stenographer of a putative folk original. Chopin’s mazurkas were by no means the first such works published for piano, but they were the first to offer up to a wider European audience an imaginary recreation of the idea of Poland in sound. The mazurka in F sharp minor, Op 6 No 1, opened the very first set of mazurkas that Chopin published (in 1833), and it wonderfully encapsulates the novelty of this new musical landscape. Its very first bars no sooner establish the home key of F sharp minor than the music slips sinuously away from and then back to this key via a chromatic sequence. Deliciously unstable harmonies of this sort would continue to feature prominently in Chopin’s sound evocation of Poland. And when the opening phrase returns, Chopin marks it ‘rubato’, thus introducing another crucial quality of this musical place: the idea of rhythmic dislocation, of the flexibility invited from the pianist in the rendering of the durations of notes, would continue to figure centrally in the genre, whether Chopin notated it explicitly or not (he stopped marking the word in his scores after 1835). And another key marker for the genre is its three-part design, with a central contrasting section setting apart statements of the principal theme. 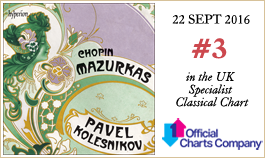 Chopin typically published his mazurkas in groups of three or four: this recording includes three such complete sets. With the four mazurkas, Op 17 (published in 1834), Chopin established a general pattern in which the concluding number of the set is usually the most lengthy and complex of the group. This pattern suggests a certain planning on Chopin’s part to ensure a kind of overall sense when an opus would be performed as a group. 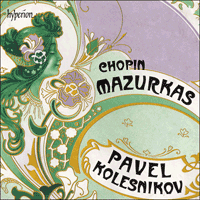 (Chopin did not insist that the mazurkas be presented in this way; indeed, he more often played individual pieces selected from different opuses, as Pavel Kolesnikov does on this recording.) In the first number of Op 17, the robust main theme frames a central section in which the duple-inflected accompaniment runs contrary to the triple-patterning in the melody. In the moody mazurka in E minor, Op 17 No 2, a curtailed reprise allowed Chopin to introduce a short coda to wrap up the piece. The opening section of the third mazurka of the set, in A flat major, introduces a more complex version of three-part form (in which the opening section itself falls into a miniature three-part shape), a fitting consequence of the complicated rhythmic and harmonic patterning of the first theme. The last mazurka of the set, in A minor, is one of Chopin’s most famous: the marvellous dissonances of the opening four bars (which return intact at the very end of the piece) introduce one of Chopin’s most limpid and touching themes (chromaticism here seems more about inwardly directed expression than about complexity itself). Chopin’s next set of mazurkas, Op 24 (published in 1836), functions elegantly as a complete grouping. In each of the first three mazurkas, a simplistic surface cloaks various subtle complexities. In the G minor, Op 24 No 1, the ‘rubato’ direction in the opening bar tells us that the relationship between melody and accompaniment is more complicated than it seems. ‘Rubato’ returns within the second mazurka of the set, as a symptom of the general metric and rhythmical displacement of the piece. (Chopin frames the beginning and end with a passage that sounds as if it is in duple metre, and when the correct triple metre establishes itself, it is continuously thrown off course by unexpected accents.) The A flat major third mazurka likewise disrupts the expected flow of its main tune, but now through repeated fermatas that raise the level of tension before each ensuing phrase. Op 24 No 4, in B flat minor, fits a stunning variety of ideas into its pages: complex form (rather like that of Op 17 No 3, but with a greater number of themes), exotic scales (especially at the start of the middle section), and, after a truncated reprise, an extraordinary, extended coda that contains some of the composer’s most remarkable chromatic and blurred harmonies. In the last complete set represented on this recording, Op 50 (published in 1842), we enter into Chopin’s late style. The first two numbers (in G major and A flat major, respectively) do not reveal much that differs from Chopin’s earlier style, apart perhaps from an especially extended coda in the first work and an interesting invitation to dislocate rhythm in the central section of the second work. But the third mazurka, in C sharp minor, brings us into a different compositional realm. It begins with strict imitation, a canon, a gesture that seems to merge the sound world of his beloved J S Bach with that of his imaginary Poland. (And Chopin likely alludes along the way to the D sharp minor Fugue from Book I of Bach’s Well-tempered Clavier.) In the period just before composing this work, Chopin had returned to the study of formal counterpoint, which was then to figure prominently in the music he composed in the short remainder of his life. And this mazurka additionally astonishes by its advanced harmonies and its complex coda, one that leads ultimately back to the opening theme, now presented, as if exhausted, in a ‘normal’ homophonic context. 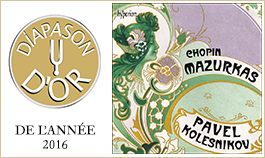 The remaining works on this recording reveal the many individual charms of Chopin’s mazurkas. The B minor, Op 30 No 2 (1838), spins by so quickly we barely notice that the opening theme never returns, or that the piece ends in F sharp minor. The sad (‘mesto’) G sharp minor mazurka, Op 33 No 1 (1838), builds its opening theme around the conceit of a cadence: it begins with a cadence, returns to it in the middle, and of course concludes with it. The seemingly simple C major, Op 33 No 3 (from 1838; in two editions from Chopin’s lifetime, this mazurka appeared as the second number of the set), figures in a famous anecdote from Wilhelm von Lenz. Lenz was playing this piece for Chopin, when the composer Giacomo Meyerbeer walked in, and impudently asserted that it was written in duple, not triple metre, causing a rare outburst of anger from Chopin. Chopin sketched the E minor Mazurka from Op 41 whilst visiting Majorca in the early days of his relationship with the famous writer George Sand, but the modal inflections heard in some of its melodies and in the cadence that ends the opening and closing sections have less to do with its place of origin than with Chopin’s enduring effort to limn the mazurka as exotic and ‘foreign’. The drone-like opening of the C major Op 56 No 2 (1844) signals a kind of rustic simplicity, an expressive mood Chopin slyly undermines when he introduces a brief canon in the middle section. In Op 56 No 3, in C minor, we have another of Chopin’s mighty and intricate set-concluding mazurkas, highlights of which include a profusion of themes and keys in the middle section, and an extended and chromatic coda. The A flat major Op 59 No 2 (1845) presents us with another example of a truncated reprise (the theme now sounding in a lower register) followed by an extended, chromatic coda. Op 59 No 3, in F sharp minor, fairly summarizes the ‘concluding mazurka’ theme: it is long and complex, it draws again on the idea of canonic imitation in the reprise of the principal theme, and it ends with an extended, dramatic coda. One unanticipated wrinkle is the appearance of a brand new theme in the last eight bars of the piece, one that provides an epigrammatic sense of closure to the work. As no manuscript survives, we have only the testimony of Chopin’s amanuensis Julian Fontana about the 1827 date of the A minor mazurka, which he was first to publish as Op 68 No 2 in his posthumous collection of Chopin’s works. Support for this date may be found in the work’s brevity and simple design, with its prominent, recurring melodic dissonance then suggesting an early effort by Chopin to associate rustic sound-images with the mazurka. During his years in Paris, Chopin published in the same year (1841) two mazurkas as separate, stand-alone pieces, both of them in A minor. One of them (KKIIb/4) appeared in a German collection called Notre temps (which became the nickname by which this mazurka is often known), as well as in an album released by the journal La France musicale. The second of them (KKIIb/5) was dedicated to Émile Gaillard, and his name is often used as a descriptive moniker for this mazurka. The B flat major mazurka on this recording (KKIIa/3) has a complicated history. Chopin is claimed to have improvised this mazurka in 1826 (though there is little evidence to support this claim). A lithograph of it was prepared in Poland, and a copy of this lithograph with some variants apparently in Chopin’s hand (a source now lost) served as the basis for an edition issued by Friedlein, which in turn served as the basis for Paderewski’s edition, and, more recently, for the new Polish National edition. The basic charms of this work suggest that it does date from Chopin’s Warsaw period, but from precisely when in the 1820s we do not know. The mazurka was a tremendously important genre for Chopin: he composed far more of them than of any other kind of piece that he wrote. They served for him as a kind of laboratory: he experimented harmonically, rhythmically, texturally and formally, in ever more interesting ways. But he did so always in the service of his desire to create a sound image of his native land, one that would resonate directly with audiences in Poland and in the rest of the world. Les mazurkas de Chopin passent pour être de la musique de connaisseurs, quelque chose de raffiné qu’il faut apprendre à aimer. Mais aucune raison particulière ne le justifie car leur charme et leur profondeur se révèlent tout aussi directement que dans les genres apparemment plus «accessibles» de Chopin comme les nocturnes ou les ballades. Les idées fausses qui entourent les mazurkas de Chopin sont sans doute dues à leur «exotisme» évident, car les gens savent généralement que le genre provient directement du peuple polonais, un mélange des caractéristiques de trois différentes danses traditionnelles ternaires (la mazur, l’oberek et la kujawiak) appelé à révéler quelque chose d’essentiel de l’âme de la musique polonaise. Mais ce sont des mythes essentialistes. Chopin n’a pas abordé la mazurka comme une sorte d’ethnographe. Même si, dans sa jeunesse, il a découvert par hasard des mazurkas jouées par des gens de la campagne, il doit surtout sa connaissance du genre à la culture urbaine de la danse: au cours du premier tiers du XIXe siècle, aucun citadin polonais n’ignorait l’existence des mazurkas qui étaient dansées dans tous les milieux sociaux. Des partitions imprimées de ces mazurkas dansées révèlent des œuvres diatoniques simples, ce qui dément la notion selon laquelle les complexités des mazurkas de Chopin reflètent d’une manière ou d’une autre leurs origines polonaises exotiques. Dans ses mazurkas, Chopin n’a pas imité un son polonais; il a créé ce son. Que Chopin ait inventé une image musicale de la Pologne est, tout compte fait, plus impressionnant que ce portrait de sténographe consciencieux d’un folklore original putatif qu’on a fait de lui. Les mazurkas de Chopin sont loin d’être les premières œuvres pour piano publiées de ce genre, mais elles furent les premières à offrir à un plus large public européen une reconstitution sonore imaginaire de la conception de la Pologne. La Mazurka en fa dièse mineur, op.6 nº 1, ouvre le tout premier recueil de mazurkas que publia Chopin (en 1833) et elle incarne merveilleusement la nouveauté de ce nouveau paysage musical. Ses toutes premières mesures ont à peine établi la tonalité de fa dièse mineur que la musique quitte sinueusement cette tonalité et y retourne en passant par une séquence chromatique. Des harmonies délicieusement instables de ce genre vont continuer à jouer un rôle important dans l’évocation sonore de la Pologne qu’en fait Chopin. Et lorsque la première phrase revient, Chopin la marque «rubato», introduisant ainsi une autre caractéristique essentielle de cet espace musical: l’idée de bouleversement rythmique, de la flexibilité à laquelle est convié le pianiste dans l’interprétation de la durée des notes, allait continuer à occuper une place centrale dans le genre, que Chopin l’ait noté explicitement ou pas (il cessa de marquer le mot dans ses partitions après 1835). Et un autre marqueur clef pour le genre est sa conception tripartite, avec une section centrale contrastée distincte des expositions du thème principal. Comme d’habitude, Chopin publia ses mazurkas en groupes de trois ou quatre: cet enregistrement comporte trois de ces recueils complets. Avec les quatre mazurkas, op.17 (publiées en 1834), Chopin établit un modèle général où le dernier numéro du recueil est généralement le plus long et le plus complexe du groupe. Ce modèle suggère une certaine planification de la part de Chopin pour donner une sorte d’impression d’ensemble quand un opus est joué entièrement (Chopin n’insistait pas pour que les mazurkas soient présentées de cette manière; en fait, il jouait le plus souvent des morceaux isolés choisis dans différents opus, comme le fait Pavel Kolesnikov dans cet enregistrement). Dans le premier numéro de l’op.17, le robuste thème principal encadre une section centrale où l’accompagnement à inflexion binaire va à l’encontre du modelage ternaire de la mélodie. Dans la sombre Mazurka en mi mineur, op.17 nº 2, une reprise écourtée permet à Chopin d’introduire une courte coda pour conclure le morceau. La section initiale de la troisième mazurka du recueil, en la bémol majeur, introduit une version plus complexe de la forme tripartite (où la section initiale elle-même rentre dans une forme tripartite miniature), conséquence adéquate du modelage rythmique et harmonique complexe du premier thème. La dernière mazurka du recueil, en la mineur, est l’une des plus célèbres de Chopin: les magnifiques dissonances des quatre mesures initiales (qui reviennent intactes à la fin du morceau) introduisent l’un des thèmes les plus limpides et touchants de Chopin (ici le chromatisme semble davantage s’appliquer à une expression dirigée intérieurement qu’à la complexité elle-même). Le recueil suivant de mazurkas de Chopin, op.24 (publié en 1836), fonctionne élégamment comme un groupe complet. Dans chacune des trois premières mazurkas, une surface simpliste enrobe diverses complexités subtiles. Dans la Mazurka en sol mineur, op.24 nº 1, l’indication «rubato» à la première mesure nous dit que la relation entre la mélodie et l’accompagnement est plus complexe qu’il n’y paraît. «Rubato» revient dans la deuxième mazurka de ce recueil, comme un symptôme du déplacement métrique et rythmique général du morceau (Chopin encadre le début et la fin avec un passage qui semble binaire et, lorsque le rythme ternaire correct s’installe, il est continuellement dévié de son cap par des accents inattendus). De même, la troisième mazurka, en la bémol majeur, bouleverse le flux escompté de son air principal, mais cette fois par des points d’orgue répétés qui élèvent le niveau de tension avant chaque phrase suivante. L’op.24 nº 4, en si bémol mineur, comporte une stupéfiante variété d’idées dans ses pages: forme complexe (un peu comme celle de l’op.17 nº 3, mais avec un plus grand nombre de thèmes), gammes exotiques (surtout au début de la section centrale) et, après une reprise tronquée, une longue et extraordinaire coda qui contient certaines des plus remarquables harmonies chromatiques et indécises du compositeur. Dans le dernier recueil complet enregistré ici, l’op.50 (publié en 1842), on entre dans le style de la fin de la vie de Chopin. Les deux premiers numéros (en sol majeur et la bémol majeur, respectivement) ne révèlent pas grand-chose qui diffère du style antérieur de Chopin, en dehors peut-être d’une coda particulièrement longue dans la première œuvre et d’une invitation intéressante à bouleverser le rythme dans la section centrale de la deuxième. Mais la troisième mazurka, en ut dièse mineur, nous emmène dans un univers différent en termes d’écriture. Elle commence avec une imitation stricte, un canon, geste qui semble mélanger l’univers sonore de son bien-aimé J. S. Bach avec celui de sa Pologne imaginaire (et Chopin fait probablement allusion quelque part en chemin à la Fugue en ré dièse mineur du Livre I du Clavier bien tempéré de Bach). Juste avant de composer cette œuvre, Chopin s’était replongé dans l’étude du contrepoint formel, qui allait jouer un rôle important dans la musique qu’il composa pendant le peu de temps qu’il lui restait à vivre. Et cette mazurka étonne en outre par ses harmonies avancées et sa coda complexe, pour revenir en fin de compte au thème initial maintenant présenté, comme s’il était épuisé, dans un contexte homophonique «normal». Le reste des œuvres présentées dans cet enregistrement révèle les nombreux charmes spécifiques des mazurkas de Chopin sous une forme isolée. La Mazurka en si mineur, op.30 nº 2 (1838), file tellement vite qu’on remarque à peine que le thème initial ne revient jamais et que le morceau s’achève en fa dièse mineur. La triste («mesto») Mazurka en sol dièse mineur, op.33 no 1 (1838), construit son thème initial autour de l’expression brillante d’une cadence: elle commence par une cadence, y revient au milieu et s’achève bien sûr avec cette cadence. La Mazurka en ut majeur, op.33 nº 3 (de 1838; elle connut deux éditions du vivant de Chopin, d’abord comme deuxième numéro du recueil), apparemment simple, fait l’objet d’une célèbre anecdote de Wilhelm von Lenz. Lenz était en train de jouer ce morceau pour Chopin, lorsque le compositeur Giacomo Meyerbeer entra dans la pièce et affirma avec insolence qu’il était écrit en rythme binaire et non ternaire, ce qui mit Chopin en colère. Chopin esquissa la Mazurka en mi mineur de l’op.41 lors d’un voyage à Majorque au début de sa liaison avec le célèbre écrivain George Sand, mais les inflexions modales que l’on trouve dans certaines de ses mélodies et dans la cadence qui termine la section initiale et la conclusion ont moins de points communs avec le lieu où elle vit le jour qu’avec les efforts incessants de Chopin pour faire de la mazurka quelque chose d’exotique et d’«étranger». Le début en forme de bourdon de la Mazurka en ut majeur, op.56 nº 2 (1844), marque une sorte de simplicité rustique, une atmosphère éloquente que Chopin ébranle avec malice lorsqu’il introduit un bref canon dans la section centrale. Avec l’op.56 nº 3, en ut mineur, on a une autre de ses mazurkas imposantes et complexes qui terminent les recueils, dont les points forts comprennent une profusion de thèmes et de tonalités dans la section centrale et une longue coda chromatique. La Mazurka en la bémol majeur, op.59 nº 2 (1845), nous présente un autre exemple de reprise tronquée (avec le thème maintenant au registre inférieur) suivie d’une longue coda chromatique. L’op.59 nº 3, en fa dièse mineur, résume bien le thème de la «mazurka conclusive»: elle est longue et complexe, elle exploite à nouveau l’idée d’imitation en canon dans la reprise du thème principal et s’achève avec une longue et dramatique coda. On y trouve quelque chose d’inattendu: l’apparition d’un thème tout nouveau dans les huit dernières mesures du morceau, un thème qui donne un sens épigrammatique de conclusion à l’œuvre. Comme aucun manuscrit ne nous est parvenu, nous n’avons que le témoignage du copiste de Chopin, Julian Fontana, au sujet de la date de 1827 pour la Mazurka en la mineur, qui fut publiée pour la première fois sous l’op.68 nº 2 dans son recueil posthume d’œuvres de Chopin. Cette date pourrait être corroborée par la brièveté de l’œuvre et sa simplicité de conception, sa dissonance mélodique importante et récurrente faisant penser à un travail de jeunesse que fit Chopin pour associer des images sonores rustiques à la mazurka. Au cours des années qu’il passa à Paris, Chopin publia en 1841 deux mazurkas isolées, toutes deux en la mineur. L’une d’entre elles (KKIIb/4) parut dans un recueil allemand intitulé Notre temps (qui devint le surnom de cette mazurka), ainsi que dans un album publié par le journal La France musicale. La seconde (KKIIb/5) fut dédiée à Émile Gaillard, dont le nom est souvent associé à cette mazurka. La Mazurka en si bémol majeur enregistrée ici (KKIIa/3) a une histoire compliquée. Chopin l’aurait improvisée en 1826 (mais rares sont les preuves qui appuient cette affirmation). Une lithographie en fut réalisée en Pologne et une copie de cette lithographie avec quelques variantes apparemment de la main de Chopin (une source aujourd’hui perdue) servit de base à une édition publiée par Friedlein qui servit à son tour de base à l’édition de Paderewski et, plus récemment, à la nouvelle édition nationale polonaise. Le charme élémentaire de cette œuvre suggère qu’elle date de la période où Chopin vivait à Varsovie, mais on ignore à quelle date précise des années 1820. La mazurka était un genre très important pour Chopin: il en composa beaucoup plus que de toute autre sorte d’œuvres qu’il écrivit. Elles furent pour lui une sorte de laboratoire: il y fit des expériences toujours plus intéressantes dans le domaine harmonique, rythmique, structurel et formel. Mais il resta toujours fidèle à son désir de créer une image sonore de son pays natal, une image qui allait directement susciter l’intérêt des auditoires de Pologne et du reste du monde. Die Mazurken von Chopin werden häufig als Expertenmusik abgestempelt—gewöhnungsbedürftig und Kennern vorbehalten. Es gibt aber keinerlei Grund, weshalb das so sein sollte, da sich ihre Reize und Tiefsinnigkeiten ebenso deutlich offenbaren, wie es bei angeblich „zugänglicheren“ Genres, wie etwa den Nocturnes oder Balladen, der Fall ist. Zweifelsohne haben derartige Missverständnisse bezüglich der Mazurken Chopins mit ihrer offensichtlichen „Exotik“ zu tun, da man als Hörer zumeist informiert wird, dass das Genre sich direkt aus der polnischen Volksmusik ableite und dass darin die Charakteristika dreier charakteristischer Volkstänze im Dreierrhythmus (der Mazur, der Oberek und der Kujawiak) miteinander kombiniert seien, um wesentliche Elemente der polnischen Musik-Seele zu offenbaren. Doch sind dies essentialistische Mythen. Chopin näherte sich der Mazurka nicht als Ethnograph. Zwar stieß er als Jugendlicher gelegentlich auf Mazurken, die von Bauern gespielt wurden, doch gründete sich seine Kenntnis des Genres überwiegend in der urbanen Tanzkultur: im ersten Drittel des 19. Jahrhunderts kamen alle polnischen Stadtbewohner mit Mazurken in Kontakt, da diese in praktisch allen sozialen Umfeldern getanzt wurden. Veröffentlichte Noten dieser getanzten Mazurken enthüllen einfache, diatonische Werke, was die Behauptung widerlegt, die Vielschichtigkeit der Mazurken Chopins beruhe auf ihren exotischen polnischen Ursprüngen. Chopin imitierte nicht ein bestimmtes polnisches Klangbild in seinen Mazurken, sondern er schuf dieses Klangbild. Und dass Chopin ein musikalisches Porträt Polens entwarf, ist ein deutlich eindrucksvolleres Konzept als jenes, das ihn als pflichtbewussten Stenographen mutmaßlicher Volksmusik darstellt. Chopins Mazurken waren durchaus nicht die ersten Werke dieser Art, die für das Klavier herausgegeben wurden, doch waren sie die ersten derartigen Werke, die eine imaginäre Neuschöpfung der Idee eines klingenden Polen einem größeren europäischen Publikum präsentierten. Die Mazurka fis-Moll, op. 6 Nr. 1, eröffnet den allerersten Mazurken-Zyklus, den Chopin herausgab (1833) und fasst das Novum dieser neuen musikalischen Landschaft wunderbar zusammen. Kaum ist in den ersten Takten die Grundtonart fis-Moll etabliert, als die Musik sich auch schon davon weg windet, um dann über eine chromatische Sequenz zu dieser Tonart wieder zurückzukehren. Derartige köstlich instabile Tonarten sollten auch weiterhin in Chopins klingender Darstellung Polens vorkommen. Und wenn die Anfangsphrase zurückkehrt, verlangt Chopin ein „Rubato“, womit ein weiteres wichtiges Charakteristikum dieses musikalischen Orts eingeführt wird: Die Idee einer rhythmischen Verlagerung, der Flexibilität, die von dem Pianisten bei der Wiedergabe der Tondauer erwartet wird, sollte auch weiterhin in dem Genre eine zentrale Rolle spielen, ob Chopin diese explizit anwies oder nicht (ab 1835 trug er dieses Wort nicht mehr in seine Notentexte ein). Ein weiteres wichtiges Kennzeichen des Genres ist ihre dreiteilige Anlage, wobei zwischen den Ausführungen des Hauptthemas ein kontrastierender Mittelteil steht. Chopin gab seine Mazurken zumeist in Dreier- oder Vierergruppen heraus—hier liegen drei derartige Werkgruppen in vollständiger Form vor. Mit den vier Mazurken op. 17 (veröffentlicht im Jahre 1834) entwickelte Chopin einen Aufbau, bei dem das längste und komplexeste Stück der Gruppe zumeist den Schluss bildete. Dieser Aufbau lässt auf ein gewisses Maß an Planung seitens Chopins schließen, mit dem er seinen Werkgruppen einen Zusammenhang verlieh, wenn sie als solche dargeboten wurden. (Allerdings bestand Chopin nicht darauf, dass seine Mazurken in dieser Weise aufgeführt werden sollten—er selbst spielte sogar öfter einzelne Stücke aus verschiedenen Zyklen, und so hält es auch Pavel Kolesnikov auf der vorliegenden Aufnahme.) In der ersten Nummer von op. 17 rahmt das robuste Hauptthema einen Mittelteil ein, in dem die geradtaktig anmutende Begleitung gegen die Melodie im Dreiertakt gesetzt ist. In der launischen Mazurka in e-Moll, op. 17 Nr. 2, erlaubt eine verkürzte Reprise es dem Komponisten, das Stück mit einer kurzen Coda abzuschließen. Die dritte Mazurka dieses Opus (in As-Dur) weist eine komplexere dreiteilige Form auf (der Anfangsteil fällt dabei ebenfalls in drei kurze Abschnitte), womit die komplizierte rhythmische und harmonische Anlage des ersten Themas sozusagen weitergeführt wird. Das letzte Stück dieser Gruppe steht in a-Moll und ist eine der berühmtesten Chopin’schen Mazurken: die herrlichen Dissonanzen der ersten vier Takte (die ganz am Ende des Stücks unversehrt wiederkehren) leiten ein besonders durchsichtiges und anrührendes Thema ein (die Chromatik scheint hierbei eher ein nach innen gerichteter Ausdruck als eine Darstellung von Komplexität zu sein). Der folgende Mazurken-Zyklus Chopins, op. 24 (herausgegeben 1836), ergibt als Ganzes eine elegante Werkgruppe. In den ersten drei Mazurken maskiert ein einfaches Äußeres diverse raffinierte Vielschichtigkeiten. In der g-Moll-Mazurka, op. 24 Nr. 1, weist die Anweisung „Rubato“ im ersten Takt darauf hin, dass die Beziehung zwischen Melodie und Begleitung komplizierter ist, als es zunächst scheint. Dieses „Rubato“ tritt auch in der zweiten Mazurka der Gruppe in Erscheinung, und zwar als Symptom der allgemeinen metrischen und rhythmischen Verschiebungen in dem Stück. (Chopin rahmt den Beginn und den Schluss mit einer Passage ein, die geradtaktig klingt; sobald sich jedoch der richtige Dreiertakt durchsetzt, wird er ständig durch unerwartete Akzente aus der Bahn geworfen.) Die dritte Mazurka in As-Dur stört ebenfalls den erwarteten Fluss der Hauptmelodie, hier allerdings durch wiederholte Fermaten, die die Spannung vor den sich jeweils anschließenden Phrasen steigern. Op. 24 Nr. 4 in b-Moll enthält überraschend unterschiedliche Ideen: eine komplexe Form (ähnlich wie op. 17 Nr. 3, jedoch mit mehr Themen), exotische Tonleitern (besonders zu Beginn des Mittelteils) sowie, nach einer verkürzten Reprise, eine ungewöhnliche, ausgedehnte Coda, die bemerkenswerte chromatische und verschwommene Harmonien enthält. Mit dem letzten vollständigen der hier vorliegenden Zyklen, op. 50 (herausgegeben 1842), wenden wir uns Chopins Spätstil zu. In den ersten beiden Nummern (jeweils in G-Dur und As-Dur) findet sich nicht viel, was sich von Chopins früherem Stil unterscheiden würde—vielleicht mit Ausnahme einer besonders langen Coda in dem ersten Werk und einer interessanten Rhythmusverschiebung im Mittelteil des zweiten Werks. Die dritte Mazurka in cis-Moll jedoch transportiert uns in ein unterschiedliches kompositorisches Gefilde. Sie beginnt mit einem streng imitatorischen Kanon—eine Geste, die die Klangwelt seines geliebten Bach mit der seines imaginierten Polens verbinden zu wollen scheint. (Zudem spielt Chopin unterwegs offenbar auf die Fuge dis-Moll aus dem ersten Teil von Bachs Wohltemperiertem Klavier an.) Kurz bevor er dieses Stück komponierte, hatte Chopin sich noch einmal dem Studium des Kontrapunkts zugewendet, was sich dann in den Werken äußern sollte, die er in der kurzen Zeit bis zu seinem Tod noch komponierte. Ebenfalls erstaunlich an dieser Mazurka sind die fortgeschrittenen Harmonien und die komplexe Coda, die letztendlich zurück zum Anfangsthema führt, welches nun, sozusagen erschöpft, in „normaler“ homophoner Umgebung erscheint. Die übrigen hier vorliegenden Werke offenbaren die vielen individuellen Reize der Chopin’schen Mazurken. Die Mazurka h-Moll, op. 30 Nr. 2 (1838), wirbelt so schnell dahin, dass man kaum wahrnimmt, dass das Anfangsthema nie zurückkehrt und dass das Stück in fis-Moll endet. Das Anfangsthema der traurigen („mesto“) Mazurka gis-Moll, op. 33 Nr. 1 (1838), ist um das Concetto einer Kadenz aufgebaut—es beginnt mit einer Kadenz, kehrt in der Mitte zu ihr zurück und endet natürlich mit ihr. Die scheinbar einfache C-Dur-Mazurka, op. 33 Nr. 3 (aus dem Jahre 1838; zu Chopins Lebzeiten in zwei verschiedenen Ausgaben und als zweites Werk des Opus veröffentlicht), kommt in einer berühmten Anekdote von Wilhelm von Lenz vor. Lenz spielte dieses Stück Chopin vor, als der Komponist Giacomo Meyerbeer in den Raum eintrat und unverfroren behauptete, dass es im Zweier- und nicht im Dreierrhythmus geschrieben sei, was einen seltenen Wutanfall bei Chopin bewirkte. Chopin skizzierte die e-Moll-Mazurka aus op. 41 während eines Mallorca-Aufenthalts zu Beginn seiner Beziehung mit der berühmten Schriftstellerin George Sand. Die modalen Wendungen, die sich in einigen Melodien bemerkbar machen und auch jeweils in der Schlusskadenz des Anfangs- und Schlussteils zu hören sind, haben jedoch weniger mit dem Entstehungsort des Stücks zu tun, sondern eher mit Chopins beständigen Bemühungen, die Mazurka als exotisch und „fremd“ darzustellen. Der bordunartige Beginn der Mazurka C-Dur, op. 56 Nr. 2 (1844), signalisiert eine Art rustikale Einfachheit—eine expressive Stimmung, die Chopin kunstvoll untergräbt, wenn er im Mittelteil einen kurzen Kanon erklingen lässt. Mit op. 56 Nr. 3 in c-Moll liegt uns eine weitere jener Mazurken vor, die das Schlusswerk eines Opus bilden—ein mächtiges und zugleich intrikates Stück, welches sich durch eine Fülle an Themen und Tonarten im Mittelteil sowie eine ausgedehnte und chromatische Coda auszeichnet. Die Mazurka As-Dur, op. 59 Nr. 2 (1845), ist ein weiteres Stück mit verkürzter Reprise (wobei das Thema in tieferer Lage erklingt), auf die eine ausgedehnte, chromatische Coda erklingt. Op. 59 Nr. 3, in fis-Moll, fasst den Topos der „abschließenden Mazurka“ redlich zusammen: sie ist lang und komplex, macht sich wiederum die Technik der kanonischen Imitation in der Reprise des Hauptthemas zunutze, und endet mit einer weitläufigen, dramatischen Coda. Eine unerwartete Falte im Stoff ist das Auftreten eines völlig neuen Themas in den letzten acht Takten des Stücks; hiermit wird das Werk in epigrammatischer Weise zu Ende geführt. Von der Mazurka a-Moll, op. 68 Nr. 2, ist kein Manuskript überliefert—es liegen uns lediglich die Angaben von Chopins Sekretär Julian Fontana vor, welcher das Stück erstmals in seiner posthumen Sammlung Chopin’scher Werke herausgab und als Entstehungsdatum das Jahr 1827 anführte. Die Kürze und die schlichte Anlage dieser Mazurka lassen jenes Datum durchaus plausibel erscheinen; die markanten, wiederkehrenden melodischen Dissonanzen weisen wohl darauf hin, dass Chopin bereits hier rustikale Klangbilder mit der Mazurka in Verbindung bringen wollte. In seiner Pariser Zeit veröffentlichte Chopin im selben Jahr (1841) zwei Mazurken als separate Einzelwerke, beide in a-Moll. Die eine (KKIIb/4) erschien in einer deutschen Sammlung mit dem Titel Notre temps (welcher zum Spitznamen dieser Mazurka wurde) und ebenfalls in einem von der Musikzeitschrift La France musicale herausgegebenen Album. Die andere (KKIIb/5) wurde Émile Gaillard gewidmet und sein Name wird oft als Beiname dieser Mazurka verwendet. Die Entstehung der hier vorliegenden Mazurka in B-Dur (KKIIa/3) ist nicht ganz geklärt. Behauptungen zufolge improvisierte Chopin dieses Stück im Jahre 1826 (doch gibt es hierzu kaum Belege). In Polen fertigte man eine Lithographie des Werks an, und eine Kopie dieser Lithographie mit einigen Varianten, angeblich in Chopins Handschrift (diese Quelle ist heute verschollen), diente als Grundlage für eine Ausgabe von Friedlein, welche wiederum als Grundlage für Paderewskis Ausgabe sowie, in neuerer Zeit, für die neue Polnische Nationalausgabe diente. Der elementare Charme dieses Werks lässt darauf schließen, dass es in der Tat aus Chopins Warschauer Zeit stammt, wann genau es jedoch in den 1820er Jahren entstanden sein könnte, lässt sich nicht rekonstruieren. Die Mazurka war für Chopin ein äußerst wichtiges und in seinem Oeuvre das mit Abstand am häufigsten vertretene Genre. Ihre Form diente ihm als eine Art Labor: hier experimentierte er in harmonischer, rhythmischer, struktureller und formaler Hinsicht, und zwar in zunehmend interessanter Weise. Doch tat er das stets unter der Prämisse, damit ein klingendes Bild seines Heimatlandes hervorzubringen, welches sowohl beim polnischen Publikum als auch im Rest der Welt direkten Widerhall finden sollte.